Mari Lyons’ current exhibition includes what may be her strongest work to date. Oil paintings dominate the nearly three dozen garden-inspired works in this installation, which also includes pastels and a watercolor. 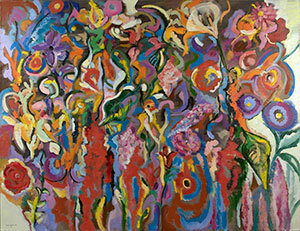 Like the exhibition title, many of the works’ titles suggest growth and change: “Expanding Garden,” “Flowers Becoming,” “Green and Purple Rising.” The best paintings, in fact, find compelling formal expressions for this growth, with what seems to me a renewed, or at least more conscious, investigation of that broad, fertile zone between the abstract and the representational. The large, seven-foot-wide canvas “Transformations” (2012) captures the likenesses of sunflower plants, facing us full-height, like a crowd viewed from a short distance. Somewhat simplified, with paler portions melting into the light background, the sunflower’s stems and leaves – a tapestry of free-form gestures – cohere as one tangible upsurge against gravity: picture an alert, milling crowd. “Living Circles” (2013) is just what its title declares: a dynamic composition of disks. Its very vertical format, however, encompasses a particular dynamism, with circles coalescing as a single, tangible presence – holding in space, resisting gravity, and springing from a ground plane located by a solitary line. Among the smaller works here, “Sum-Motion” (2013), achieves a luminous denseness with swirling notes of rich scarlet, orange, and blue-green, punctuated by light yellows. But the most agile canvases here tend to be the largest. Many artists seem to labor when working on a large scale, but not Ms. Lyons. The highly abstracted, nearly seven-foot-wide “Dark Flowers Forming” (2013) feels at once spontaneous and purposeful in its design of churning deep reds, cerulean blues, and purples, their rhythms laced with buoyant yellow and yellow-green squiggles. Individual blossoms and leaves can be picked out here and there, but all elements ultimately assert themselves not as illustrated events but as formal impulses, with hues alternately pressing upon and yielding to others. The effect is of a pulsating wall, varied and deepened by its lively, independent constituents. In this striking canvas, elements don’t simply accumulate, but gather in complex, decisive fashion – in short, they grow.